After being away for the long weekend, our fridge was wiped clean of any + all vegetables. As evidenced by my cheese-only pizza. Chris needed the car this week for work + school so I didn’t get the chance to go to the store. Good thing you don’t need vegetables to make cake. I was also completely out of eggs. And after the first failed attempt [photos 1+2] I had a breakfast snack cake that required no vegetables and no eggs. The funny thing about recipe creating + photography is that you have to start taking photos before you know if something has failed. This is most typically the case with baked goods. I didn’t waste much time with the photographing and got right to the taste testing and then headed back to the kitchen. The first trial was way too dry. The second trial was nowhere near as dense and definitely not dry. 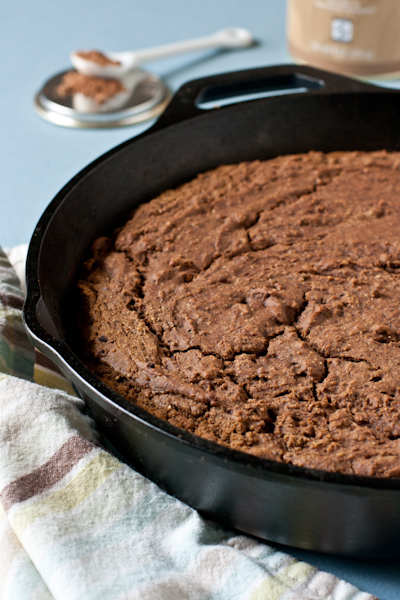 This is a barely sweet, chocolately cake, with a hint of coffee. Perfect for breakfast or snacking. 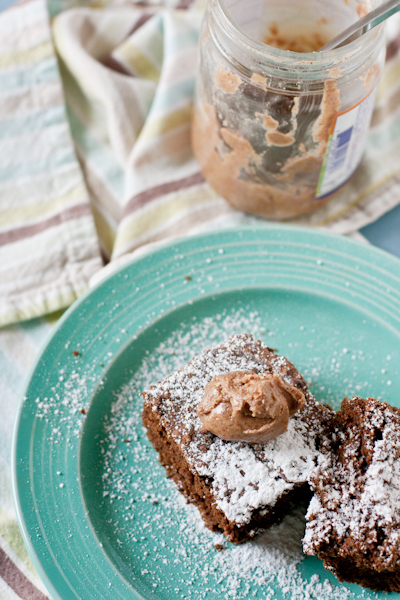 Dunked in coffee, dusted with powdered sugar, or slathered with almond butter. Take your pick or try all three. It is the weekend. 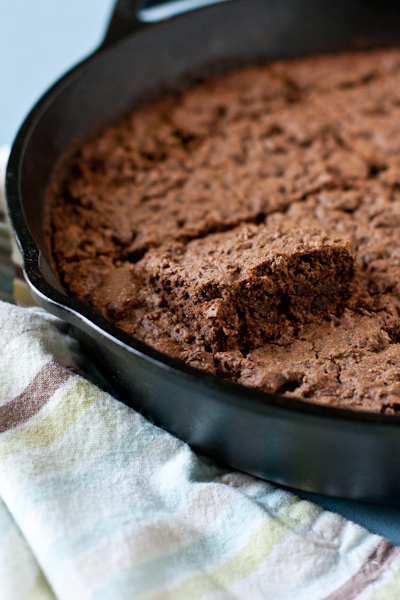 In a 9x9 baking pan or 10” cast iron pan, place 1 Tablespoon oil in the pan and put into the oven for 5min to heat. In a bowl, mix together the buckwheat flour, oat flour, sweet rice flour, almond meal, flax, cocoa powder, baking powder, salt, and baking soda. In another bowl, whisk together the instant coffee, milk, maple syrup, 3T oil, pumpkin puree and vanilla until well combined. Stir the dry ingredients into the wet until just combined. Avoid over-stirring. The batter will be thick, but not dry. It should be semi-pourable. 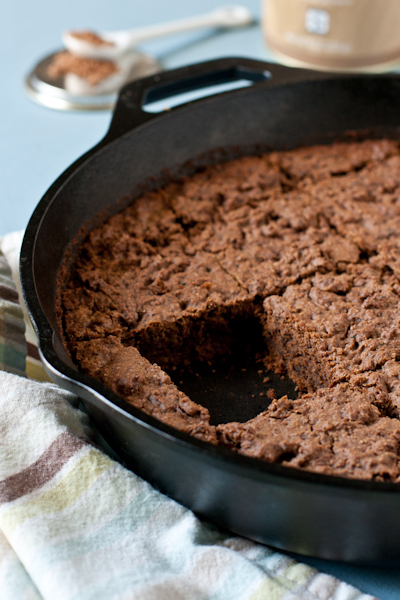 Place the batter into the hot, greased pan, and carefully spread to the edges of the pan. Toothpick test for doneness. It should be moist, but not gooey or bone dry. It’s important to let fully cool before cutting [or it will be crumbly] and store tightly covered once cooled + cut. notes: You can use all buckwheat or all oat flour instead of the combination. Chocolate chips and/or nuts can be added. If adding nuts, add 1 Tablespoon extra milk. The pumpkin adds no flavor, but keeps the cake moist. For high altitude – set oven to 375* and use 1 1/4 teaspoons baking powder. You can make almond meal by grinding raw almonds [unsalted/unroasted] into a meal like flour. Honey can be used in place of maple syrup. Well mashed banana can be used in place of pumpkin puree. Now. I have an overflowing plate of cake to attend to. See you back here soon!